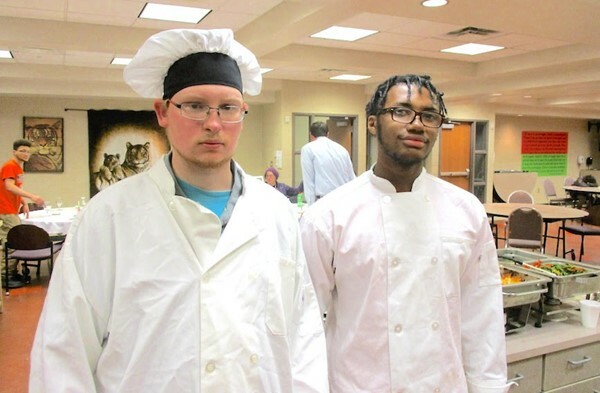 Seniors Bryce Gillum and Myron Barnhill-Rankin are involved in state culinary arts competition through SkillsUSA. One culinary arts senior has represented Mansfield Senior High in spring SkillsUSA Ohio competition in Columbus. Another senior will compete later this month. Bryce Gillum demonstrated his baking skills during a grueling six-hour marathon at Columbus State Community College in March. On April 24 Myron Barnhill-Rankin will have three hours to prepare and serve a complete chicken dinner at the Greater Columbus Convention Center. Gillum was required to bake muffins, rolls, a pie, a cake and cookies during the six-hour event that included competitors from schools that teach only baking. The Senior High programalso teaches all aspects of food preparation and cooking. “Bryce did not place, but he did exceptionally well,” said Chef Tom Blike, Senior High culinary instructor, who accompanied Gillum to the contest. Gillum, who is on Senior High’s Merit Roll (3.3-3.69 GPA), will enroll in the culinary arts program at the Bradford School in Columbus in July. His career goal is to become a chef on a cruise ship. Barnhill-Rankin will travel to Columbus with Chef Ed Golden on April 24 when he competes against culinary students from 18 other schools. Barnhill-Rankin, who is on Senior High’s Honor Roll (3.7-4.0 GPA), hopes to have his own restaurant someday. Sanitation and knife skills are part of all culinary competitions. SkillsUSA serves more than 335,000 students and instructors in Career Tech programs across the country. Senior High became a chapter member last fall.